Back to back floral encasements, some including butterflies. Colored matrix and translucent white base. 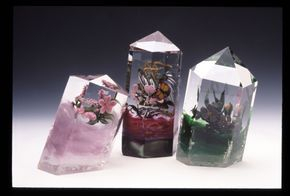 Cut and faceted into crystal shape. Single large diameter ballflower encased in schott crystal. 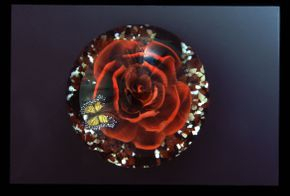 Murrine butterfly floating above the rose. Centralized Madonna murrine surrounded by 14 elaborate pattern murrini. Carved and polished goldstone intarsia, circular murrini loop pattern finishes the border. Wheel engraved carving by Ed Poore on lower sides.